This is a breaking news announced by Punjab Examination Commission (PEC) that ALL 5th & 8th Class Students Declared Pass in Punjab 2018 Results for the exams conducted in February and March for 1st class to 8th grade. This news is hovering over the Social Media and getting fired by students as they are so much happy to see that they will defiantly pass these exams for 5th and 8th class. This is confirm that every student is declared pass by PEC. ALL The 5th & 8th Class Students Declared Pass in Whole Punjab and detailed Results will be declared on 31st of March 2018 after 10:00AM. As Punjab Examination Announced results of 5th & 8th class on last day of March be sure to check your results. 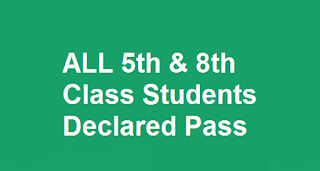 So that all the students of 5th and 8th classes are declared as pass for these 2018 results and if you want to know more about it read above notice or comment below.